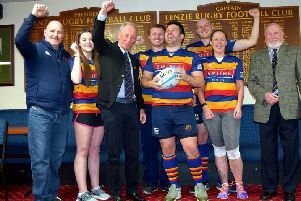 Lenzie gained all five points in a 26-12 win over Cumnock in their final BT West Division 2 game of the season at Viewfield on Saturday. The victory moved Lenzie into a top four position, a great credit to the players and coach Boyd Carswell after the very slow start of the season. Lenzie surprised the large home support by starting the game well and going in front when Haddow cleverly put young Buick clear on the wing to score a converted try. Lenzie continued to press Cumnock and improved their ball retention to enable a further score for the home side by Scouller which he converted to put Lenzie further in front at 14-0. The home side were now in charge of the lineout and scrum, but the breakdown continued to be messy with a number of penalties being awarded to both sides which disrupted the game. Just before the break Lenzie won a scrum against the head to allow Scouller to break free and a deft kick put Buick through to score his second try to bring the score to 19-0 for Lenzie at the break. The home crowd were eagerly looking for more of the same in the second period, but it was Cumnock who took the initiative with a reorganised scrum and back division and it was no surprise when they scored two tries in quick succession to peg Lenzie’s lead back to a slender 19-12. Lenzie eventually regained control of the game in the final 15 minutes through the efforts of Fraser, Slade, McManus, Williams and Haddow and the home side were unfortunate not to score on a number of occasions as the final whistle approached. Finally some excellent team work put the dangerous Nisbet through the middle of the visitors defence before he outpaced the Cumnock full back to score and achieve the all important try scoring bonus point for Lenzie. Man of the match for Lenzie was young James Buick for his two tries and dangerous running throughout the game. While this was Lenzie’s final league game of the season, they do have a game this Saturday when they face Irvine at Viewfield in the West Regional Shield, kick-off 1.30pm.